So, you’ve started learning an instrument or sing: Congrats! But once you have found a great teacher and are registered for lessons, you must add one more ingredient to your musical success: practice! But it's often difficult to go through everything we have to do in a day, so how can we "squeeze in" some practice time, and why? I like to answer that question with our school’s motto: practice determines progress! That's right! Being consistent with your weekly lessons and planning for several years of music lessons is great and will ensure you become very good at your instrument, BUT, without regular practice, you won't progress as fast as you should and could. Because the ideal scenario for great improvement consists of attending your weekly lessons, AND practicing everything you've learned several times during the week, with the goal of going to your next lesson with everything learned and every homework done. Basically, that means you're able to play or sing with ease everything you've learned the week before, and all your music theory homework has been neatly done. Sounds great? For sure! But how do we get there? Here are a few great tips. 1. Establish a convenient place to practice in your home. In order for practice to happen in the first place, you need to find a comfortable and convenient spot in your home. 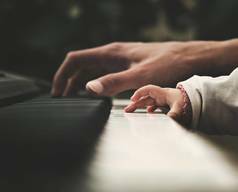 Usually, children won't do well at practicing if they are in a basement, or alone in their room (unless the door stays open and there's regular monitoring from a parent). Likewise, if you're too cramped, or the lighting is insufficient, it will affect how you practice. 2. Have the right instrument, tools, and all music books ready. If you are a piano student, it's important to have a good piano or digital piano to practice on. If you have a small keyboard, there are some pieces you won't be able to play. If you don't have a pedal, you won't be able to learn that aspect of piano playing. If you are a singer, you should record all your lessons and save these lessons all in one folder for easy access and reference. Warm up and practice your songs using a piano and/or a pre-recorded piano accompaniment. Use a metronome to learn to keep a steady tempo. Keep all your music books together in a dedicated "music bag". Have pencils and an eraser ready for your theory homework and for your lessons. 3. Schedule in a daily practice time. You have to treat your practice time like an important appointment. Put it in your calendar! Children will comply better with daily practicing if it is kept at a consistent time every day (as much as your other activities allow). Schedule shorter, but more frequent practice sessions rather than "cramming in" 1 or 2 hours of "emergency" practicing the night before your lesson. Your teacher is easily able to see if you have practiced well, and the key to learning is repetition, repetition, repetition! Aim for a minimum of 3 weekly practices if possible, with the ideal being 5-6 practices. It will pay off in no time! 4. Practice, even if you don't feel like it. In 40 years of music learning/playing/studying/teaching/performing, I have learned that sometimes the best practices happen when you least feel like it. If you are a parent, don't expect your child to jump and cheer when practice time comes. I know I didn't like practicing always, and I became a professional musician and singer! Be firm about practicing, and if you can, stay around to encourage, supervise, or answer questions. Congratulate your child upon completing their daily practice! If you are an adult, schedule your practice time when you're not too tired from your work day if possible. If you're tired, practice still, you'll finish your practice in better shape than you were before (kind of like exercising!). 5. Log in your progress and write down questions. You can create and decorate a home calendar dedicated to practicing. Place a sticker for every practice done. If you have questions when practicing, write them down in your music dictation book and make sure you start your next lesson by showing these questions to your teacher. This way, you'll make learning easier and your teacher can help you better and more accurately. If you wish, you can purchase an "Assignment Book", or a nice "Practice Book" to help you with your practicing. Keep track of all your practicing and reward your child (or your own) efforts at the end of every month! It doesn't have to be expensive! Praise your child at the end of every practice time, or if you are the one doing the practicing, reward your efforts with a nice cup of tea or treat for example (maybe not chocolate cake every day, though!). Your best reward however will be arriving at your lesson very confident and progressing much faster, which in turn will keep you motivated for more practicing! For more tips on maximizing your practice time, please contact the expert contributor.